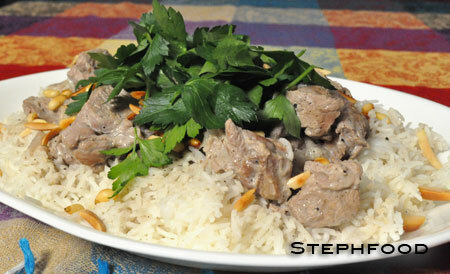 Mansaf is considered the national dish of Jordan, where they use it to show respect and hospitality to guests. On the surface, it looks like plain meat and rice, unnaturally dressed up with too much parsley – but if you could smell it, your opinion would quickly change. This is the first installment of my ‘Cookbook Diving’ series, where I dig up recipes from my lonely little cookbooks. I have a number of cookbooks that I rarely use, especially now that it’s so easy to find recipes on the internet. I thought it was about time I start finding some tasty treasures on my own bookshelf, so here we go! Earlier, I posted about our Greek themed meal featuring my first attempt at Spanakopita. Since we couldn’t make an entire meal out of spinach pie, I thought I should dig around for some other treats. I decided to make eggplant bundles, stuffed with tomato, herbs and cheese. This recipe is actually from an Italian cookbook, but since many of the ingredients cross over with Greek cuisine, I thought I could modify it to make it work with our meal. I did the obvious, and simply replaced the herbs and the type of cheese used, since they wouldn’t change the basic structure of the dish. This pic gives you a bit of a peek inside at the tomato… sneaky little food! These were very simple to make, but some of them didn’t want to stay together when I flipped them on the baking sheet. No worries! It’s pretty easy to just stuff it all back together. I modified the original recipe to coat the bundles with the leftover butter/herb/spinach juice from the spanakopita, which worked really well and added some extra flavour. There was also a sun-dried tomato dressing that was meant to be drizzled on top of the bundles when served, but I just left that off. I don’t think it was missing anything. After a little bit of digging, I found something new in one of my dusty cookbooks. I wonder what other hidden gems I’ve been sitting on! Remove the stalks from the eggplants and cut them lengthwise into thin slices — the aim is to get 16 slices in total (about 1/4 inch thick). Ignore the first & last slices. Bring a large pan of salted water to a boil an cook the eggplant for a couple of minutes, or until just softened. Drain the sliced eggplant and pat dry using a clean towel. Set aside. Mash the cheese a little, so there aren’t any big chunks. Cut each tomato into 8 slices, ignoring the first & last slices. Take two eggplant slices and place on a baking shet, forming a cross. Place a slice of tomato in the centre of the cross, season with salt & pepper, then add a sprig of parsley and/or dill, followed by a dollop of cheese, a sprinkle of oregano, a slice of tomato and more salt & pepper. Fold the ends ofthe eggplant slices around the cheese and tomato filling to make a neat bundle. Repeat with the rest of the ingredients to make 8 bundles. Chill the bundles for about 20 minutes. Preheat the broiler. Brush the bundles with oilive oil and cook for about 5 minutes on each side, or until golden. Serve hot. 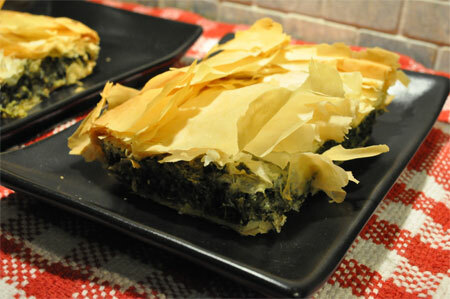 Greek spinach and feta pie, spanakopita, has been a favourite of mine for years, but I had never tried making it before. A couple of weeks ago, I was watching or reading something that said that even a child could make it, it was that easy. I got offended and decided to make some myself. It was pretty darn easy!! Let’s forget the part where I didn’t know how to deal with filo and took it out of the freezer RIGHT when I needed to use it. I mean, the recipe I had didn’t mention anything about thawing out the filo, so how was I supposed to know you’re supposed to thaw it in the fridge for 12-24 hours before you need it! As panic was sinking in, I made things worse by searching the internet for “how to quick thaw filo”, only to find the direst warnings NOT to try to quick thaw filo. Crap on a stick. Ignoring all of the warnings, I laid the frozen roll on my cooktop (the oven was on, and keeping things a little warm) and slowly warmed and rolled out the filo. There were a few more cracks than there might have been otherwise, but I was so relieved to be able to resolve the problem quickly and move on to the building of my pie. I have modified the recipe below to include that the filo needs to be THAWED, argh. It turned out fantasticly, and we probably ate more of it than we should have. I should mention that I made half of the recipe listed below — but keep in mind that you still need about 14 sheets of filo. I just made it in an 8×8 pan instead of 9×9, requiring less filling, but the same number of filo sheets (just shorter ones). It was probably a little flatter because of this, but no less delicious. Seriously, we didn’t need bigger! 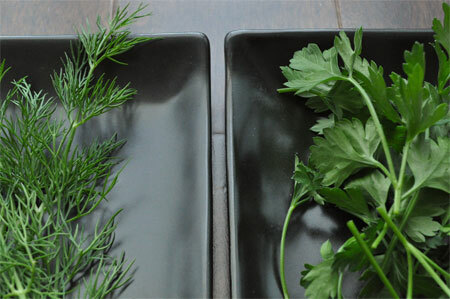 When I first saw this recipe, I saw that there was dill and parsley and no oregano. I thought that was odd (huh, dill, weird). On first bite, I realized that the dill flavour really makes it. We ate this with a lovely spread of Greek-inspired food, such as dolmathakia (grape leaves stuffed with rice and herbs), various greek olives, feta and tomatoes with oregano, grilled squid and some lovely eggplant bundles (which will be covered in a future post). Also, lots of wine (sorry, I didn’t have any Ouzo or Metaxa). I’m actually making a greeky brunch for us tomorrow, too, thanks to the new Food & Drink magazine. More on that later! Preheat oven to 350°F. Heat 2tbsp butter or oil in a large skillet or sauté pan over medium-high heat. Add the scallions and sauté for about 2 minutes. Add the spinach in batches, stirring each addition to wilt. Finally stir in the dill and parsley. Remove to a colander or strainer and allow to cool somewhat. When the spinach is cool enough to handle, squeeze out any excess liquid. Remove the spinach to a cutting board and coarsely chop. Mix together the spinach, feta, salt and pepper in a large bowl. Adjust seasoning to taste and stir in the eggs. Grease a 9-inch square baking dish or a deep-dish pie tin. Lay a layer of filo over the dish and brush with butter or oil. Add 5 or six more sheets of filo, each at a different angle to cover the entire bottom of the dish, brushing each layer with butter or oil before adding the next. Press the filo carefully down into all corners of the dish. Add the spinach-cheese filling to the dish and spread out evenly. Using the remaining filo, repeat the process of adding layers to form a top to the dish. Trim the edges of filo to leave about 1 1/2 inches hanging over the edge of the dish. Roll the edges together toward the center of the dish to seal the spanikopita. Place the dish in the preheated oven and bake until the crust is nicely browned, anywhere from 45-60 minutes. Remove from the oven and cool for about 15 minutes before serving.